12 Inputs, and a USB audio interface built-in. 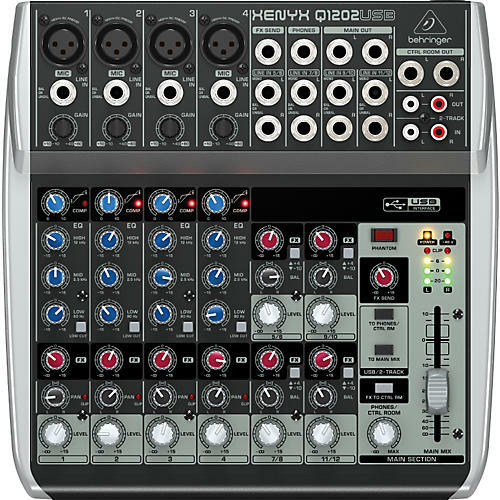 The Behringer XENYX Q1202USB mixer is made to handle live gigs, and provide you with the required tools necessary to capture professional-quality recordings. Along with its built-in USB/audio interface, and œone-knob mono channel compressor, the XENYX Q1202USB mixer comes with enough recording and editing software to turn your computer into a complete recording studio. The largest of the XENYX Q Series, The XENYX Q1202USB is built for versatility and tone, and is equally at home at your live gig or in the studio. This compact mixer provides 4 mono channels with phantom-powered XENYX mic preamps, neo-classic 3-band British-style EQ, plus 4 stereo channels. Behringer has put together a massive software download that includes Audacity (the most popular open source audio editor), Podifier, Juice, Podnova and Golden Ear (a great selection of podcasting software). You'e ready to go live on your PC or Mac right out of the box! You also get more than 100 virtual instruments and 50 FX plug-ins, turning your computer into a complete home-based or mobile recording studio. Functional and affordable, order the XENYX Q1202USB today.